No three-month hiatus this time, although I’m surprised at the number of visitors who have found the site since my last post. And the number of young autistic visitors for church services is also on the rise. Kelly Heyboer of USA Today published a story late last month highlighting increased acceptance of autistic parishioners in church services by illuminating efforts in New Jersey. The director of pastoral ministry with persons with disabilities for the Archdiocese of Newark said despite the heart and theology Christian churches offer to patrons, not all who attend worship live the meaning. The director runs the “Attends Mass” program that offers training for religious educators and support groups for parents, while a few churches host an event similar to sensory-friendly screenings from movie theaters. Called Inclusive Family Masses, autistic children can be loud or disruptive with no chance of being escorted out of church. Caldwell College and its campus chapel also actively engages in integrating autistic children with Christ, where a new Center for Autism and Applied Behavioral Analysis just opened. A Caldwell graduate student was featured by Heyboer for her involvement in the “Mass mentors” program. A dozen New Jersey children have buddied up with mentors who train them on proper behavior while attending Mass. The process, the subject of a doctoral dissertation by Caldwell’s graduate student, begins by bringing children to the last five minutes of Mass and slowly adapting them to the entire service, called “backward chaining.” The executive director for Caldwell’s autism center says “backward chaining” is applicable to any religious following. Heyboer bookends her story with the “backward chaining” approach, even though readers aren’t aware of the term until the next-to-last paragraph. Her first two paragraphs highlight the method’s effectiveness with an autistic boy who spent months of training to manage Mass, while the end of the story spells out the steps I listed earlier. No quotes are given to non-scholarly sources, not even from the mother and son featured in the lead, with the expected angle of struggling with church placed with a mother of an autistic teen who also is a task force member of the National Catholic Partnership on Disability. While her experience may validate the obstacles she battled with bringing her autistic son to church, readers don’t get much perspective on the response from beneficiaries of the services featured in Heyboer’s article. The premise would likely be similar, but getting a word with people not directly involved in efforts can provide a more unbiased analysis on the success rate of implemented programs. Heyboer’s story is a far cry from the controversy generated three years ago when a rural Minnesota church filed a restraining order banning a 13-year-old autistic boy because of loud outbursts (and that story was played heavily in Minnesota media as such a move was unprecedented to journalists). With Minnesota’s growing ties to autism in the Somali population, where Islam is the predominant religious practice, I wouldn’t be surprised if a religious leader or two from that community picks up this story and applies the “backward chaining” method discussed at the end of Heyboer’s article. The struggles families with autism face at their place of worship are already documented in Twin Cities media, which included a discussion of how far is too far when balancing accessibility and safety. Not seeing a similar story in the Twin Cities may sound surprising when they were briefly the center for autism and religion at first, but since several methods in Heyboer’s story are relatively new, not even the speed of today’s news will ring bells in the brains of news producers and editors immediately. Regardless of the denomination (the story focused on Catholics), big crowds, loud music, and long periods of silence or monotony can overwhelm the senses. Combine nerves of parents already cautious about bringing their autistic children in public places, and not even the teachings of religious leaders can prevent isolation. Such concerns have led some priests and parishioners to discourage autistic children from attending church service. Heyboer’s story suggests that trend is reversing. No matter who people worship, I imagine families with autistic children will have their prayers answered, if not already addressed. ESPN, the worldwide leader in autism? If you’ve never heard of ESPN before, congratulations on escaping your cave. The network that launched SportsCenter and grew from its small Bristol, Conn. roots in 1979 to a cultural phenomenon can now claim they covered the first publicly-known autistic rapper: Minnesota native 50 Tyson. 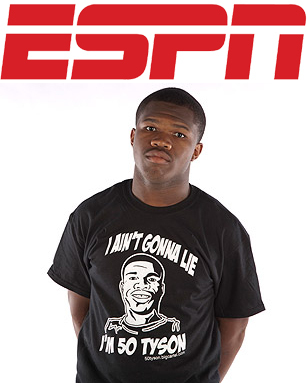 You might say “What does 50 Tyson have to do with sports?” Although 50 Tyson, whose real name is Antonio Henderson-Davis, did play high school football for Minneapolis Edison High School, ESPN usually sticks with professional and NCAA Division I sports. That’s where Antonio’s record label comes in; his owner is former NBA player Troy Hudson, whose most productive years were with the Minnesota Timberwolves. Freelancer Kalani Simpson contributed a profile for ESPN’s page 2, a site for sports figures in the news but not necessarily for athletics. Because the article is geared toward a national audience, Simpson gives us a quick glance at how 50 Tyson landed a record deal, an accomplishment not all musicians get early in their lifetime (Antonio turned 18 recently). Hudson watched YouTube videos posted by Henderson-Davis when the rapper sneaked his sister’s camera and spit off a few freestyle rhymes in his bathroom. Now, Henderson-Davis has released his first album to coincide with Autism Awareness Month, aptly titled “50 Tyson Presents the Rhythm of Autism Vol. 1.” Simpson, who writes a weekly column for FoxSports.com, would have posted this story sooner, but his interview with Hudson and Henderson-Davis was delayed as both sought out a tuxedo for Henderson-Davis’ school prom. Although concern lingers with how an autistic music artist will handle show business, Hudson believes the biggest name on his label will change the world, with Hudson still learning about what he calls his most important project he’s ever done. 50 Tyson has no trouble embracing his autistic roots; he headlined a concert during the Autism Society of Minnesota’s annual fundraising event. In terms of young autistic celebrities, 50 Tyson has the most staying power. Jason McElwain flooded the airwaves five years ago with his famous 20-point performance in his first and only high school basketball game, but attention has faded. The owner and writer of this blog has morphed into an adult but is still looking for a big break in a profession with less glamor than music, although no less fulfilling. Meanwhile, 50 Tyson has grown to be a darling of the locals for the same reason McElwain and this writer developed followings of our own, regardless of the magnitude, we found a talent of some sort and that trait has captured the hearts of a public still investigating autism itself. 50 Tyson’s mainstream exposure has permeated for some time now, gaining fans who are notable names themselves and last fall’s Star Tribune profile piece that introduced the Twin Cities rapping sensation to his hometown media market. Even one of my friends paid a visit to get a photo with him following a recent Timberwolves game we attended. We have yet to hear of any fallout with 50 Tyson and his label, or with anyone else, which is a positive sign in the fast-paced business of music. As I mentioned in my first discussion of 50 Tyson’s mainstream coverage, the community still holds genuine curiosity about his activity because he’s in a position no known autistic person has assumed before. It’s an interest that may not fade for years as 50 Tyson grows in age, wisdom, ability and possibly name recognition. Even though ESPN placed Simpson’s story on Page 2, the network owned by Disney isn’t shy to promote stories of this nature when there’s a sports tie-in, as Troy Hudson has with his NBA career. Speaking of the story, Simpson’s may sound redundant if you’ve followed 50 Tyson to this point, but when you’re writing for a national audience about a personality who isn’t too famous outside of Minnesota, you have to consider the number of first-time readers when writing the story. Simpson also had to factor an audience whose source of news doesn’t explore autism as deeply as general news outlets. Considering those elements, Simpson was effective at briefly explaining Antonio’s differences compared to his peers because he also included a storyline to keep Antonio human. For parents who worry about their children ever going to a prom, seeing a rapper getting ready for one is a welcome line of reading. 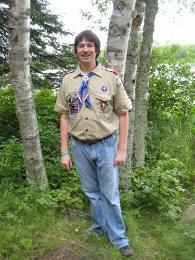 A freelance article published in the Star Tribune highlights an autistic man honored after earning the rank of Eagle Scout, the highest honor possible in the Boy Scouts of America. His case would fall somewhere in the middle of the spectrum; Keely reads at a third-grade level, his motor skills aren’t up to speed with his peers, and he definitely loathes physical contact. The Boy Scouts have revised their requirements over the years to accommodate Scouts with disabilities, and the writer spends some time highlighting their inclusion of people with disabilities, offering a brief respite from criticism over not allowing gays to serve as troop leaders. The adjustments allow parents to “mainstream” kids in Cub Scout packs before switching to special-needs troops or deciding to stay with regular troops when they move to Boy Scout packs. Regarding the autism side, the writer’s explanation of the disability and Keely’s challenges parallels stories I encountered five years ago about autism. Using contrast to tell the story, she explains all the typical elements included in Keely’s Court of Honor ceremony, then throws the bombshell that he’s autistic. Unfortunately, autism is clearly explained in the article’s headline, which spoils the surprise included in the story. I wonder how many times we’ll read or hear all the drawbacks that autistic people deal with in the social environment before the writers and/or audience realizes that many cases parallel each other, even if the severity doesn’t. Using Keely’s story to transition into the Boy Scouts’ response to special-needs kids was effective, but it may have also buried the story underneath. Assuming that Boy Scouts allows young males with any disability to participate, there’s a worthwhile story that members would be thrilled to share, especially with a massive celebration coming next month to celebrate the 100th anniversary of the Boy Scouts of America. Stories of concerns have surfaced about how to handle all these autistic people…she found an answer and didn’t aggressively make that point. Evaluating the knowledge the writer has on the subject is virtually impossible with only one article as evidence, but my analysis suggests the writer may not know much about autism and structured her article for others in her position, although that group is slowly shrinking. Comeback stories are good for morale, but they get repetitive for me as I’ve critiqued a few dozen articles since this site was launched. Reporters assigned to autism stories may want to take note that the “pedestal” angle works for a while, but runs the risk of annoying the attentive portion of the audience who want to know what will happen beyond. In this case, how Keely’s Eagle Scout rank could help him adapt to life when he leaves his troop or how the Boy Scouts may evolve as an option for autistic boys looking to enjoy themselves. The docudrama play Autistic License has performed for some time, making a review of the performance somewhat illogical. Instead, I’ll offer an interpretation of the significance in the growing saturation of autism in media. For those unfamiliar with Autistic License, the play serves as a primer for newcomers seeking to learn autism while simultaneously identifying with audience members who have autistic relatives, using common struggles for autistic parents as plot devices to drive the story. I won’t spoil the end for those who have yet to watch or see the play, but if you know someone who has autism, this play will likely rub off on you. Stacey Dinner-Levin’s first full-length play was named one of the 10 best plays of 2007 by the Pioneer Press. The play was based on the experiences of raising an autistic son, the oldest of four boys. The script was completed in 2005, prior to the breakthrough story of Jason McElwain’s 20-point performance at a high school basketball game. In other words, when the play was materialized, autism still had yet to truly saturate the mainstream audience. In what I’ll call the “Rain Man” era of autism in media (before McElwain’s story was a national headline), writers and reporters focused on introducing autism to a strange world. Autistic License reflects that, condensing the stages of an autistic child’s development to less than 90 minutes while acknowledging that results may vary. There is a moment that forebodes the next stage of media exposure in autism: exploring the many paths of the spectrum. A scene with the mother and a psychiatrist who makes the diagnosis brings the two to a conversation about the future of the mother’s autistic child. The behavioral patterns expressed by the child (played by an adult actor) reinforce the idea that life will operate in ways uncommon to a neurotypical community. When the mother and psychiatrist depart, a lesson is told to help relatives make the most out of their child’s condition. A few years later, the exploratory stage is unfolding with contemporary autism stories. WCCO is airing an exploration piece tomorrow night; you’ll hear my thoughts after the broadcast. In the interim, Autistic License is the most resourceful type of media created in the “Rain Man era.” Parents aren’t left to wonder what will become of their autistic kids, which can save them a lot of stress. Although media exposure in autism has since transitioned to the “McElwain era,” anyone looking to play catch-up will find this production fruitful. A college course on autism (such classes do exist) could point out the accuracy in portraying autism by comparing this play to the most famous representation before it: Rain Man. Watch the two back-to-back sometime to see how time often plays its own hand in shaping our perceptions. Create your own analysis and obtain a copy of the play by visiting their website.